District 6450 Governor-Elect Visits This Week! BOO! IT'S RAFFLE DRAWING DAY! THIS TUESDAY is our Annual Raffle day! Remember we are asking that each Rotarian sell or purchase at least 4 tickets. Many have reached that goal and beyond--thank you! For the rest, please make an effort between now and Tuesday. Thank You and Good Luck. Joliet Area Community Hospice volunteer Jackie Castelli, received the Silver Eagle Award that honors local senior volunteers. The Joliet Rotary Club Senior Eagle Award is designed to recognize individuals who are 65-years-old and over, who without fanfare, go “beyond the call of duty” and contribute their time and talent for the good of the community and its citizens. Jackie has been a valued Hospice volunteer for more than 14 years; in 2016, she gave over 400 volunteer hours. Jackie is pictured with Joliet Area Community Hospice volunteer manager Denise Payton, and Joliet Rotarian Ines Kutlesa. Includes a t-shirt for each attendee. Specific size requests are due by Tuesday Oct. 3rd. Sign up through Clubrunner (www.jolietrotary.com) or at the regular meeting. For information contact Cheryl McCarthy at 815-955-0152. The Joliet Rotary Club was honored to have the opportunity to support the Joliet Area YMCA and the George Werden Buck Boys & Girls Club of Joliet with donations from our 2016-2017 Rotary Raffle. $32,000 was raised and made available for local area charitable projects. 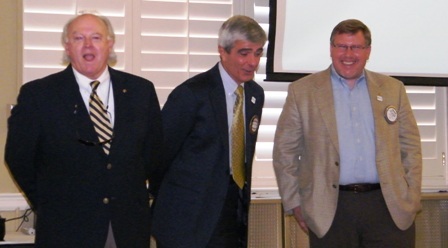 Pictured left to right: Rotary Past-President Mark Griglione, Boys/Girls Club Director Kahil Diab, YMCA Development Director Julie Wilkinson, YMCA CEO Jim Watts, and Rotary President Dan Malinowski. To my wife of 30 years, Laura Baron Malinowski for supporting me, putting up with my varied life’s passions, not the least of which is this Club. 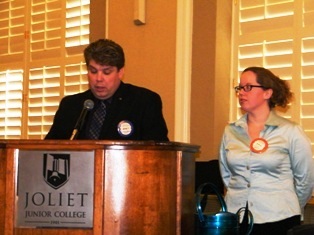 As a note, our 15th wedding anniversary was my first day in the Rotary Club of Joliet. Our 30th will be celebrated during my year as President. To my family, our children, Anna, Mary, Julia, Michael. I love them, love exploring life with them. They are not here today at the installation but that is because they are thankfully all gainfully employed. To Bob Baron and his wife Lorraine who encouraged me to join Rotary 15 years ago, and for introducing me to the world of international Rotarians, not just Rotary International. To the past and incoming Joliet Rotary Club Board members, you all have worked very hard to implement new ideas but also complete the good work started by previous Presidents and Boards. To the past Joliet Rotary Club Presidents for your leadership, and guidance to me. So many of you have wished me well and promised your support. I will definitely lean on you all. To District Governor Osei David Andrews-Hutchinson, thank you for coming here today, for engaging in our club, meeting with me at District events and in Seoul. Here is something for you – Zikomo, which is what the people of Malawi say to show gratitude. You are all unique people in the overall population. You have made a choice to join a club that is more than a social club, it is a club where the members serve others. That is not a common decision in today's world. But you decided that this is the place to be for you. THANKS to you for making that decision. 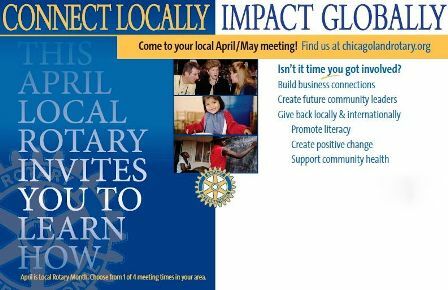 Last Chance: Rotary District Conference this week! The new board members are front left to right: Bret Mitchell, past president; Anastasia Tuskey, director-club service; Kathleen Zydek, director-community service; Damon Sloan, director-vocational service; Jeff Pierson, treasurer; Jen Howard, secretary; Mark Griglione, president; Cheryl McCarthy, vice president; and Dan Malinowski, president elect. Paul Harris Fellows: Mike Hennessy, Joliet Rotary Foundation chair (far left) and Joliet Rotary Club President Bret Mitchell (far right) welcomed Tricia Simpson, Judge Bob Baron, Jeff Tyner, Judge Jeff Allen, Carol Andrew, Mel Gray, Joe Turk, and Jim Costello as Paul Harris Fellows in recognition for their continued support of the Rotary Foundation. At the June 9 meeting, members of the Joliet Rotary Club who achieved a Paul Harris Fellow status of higher were recognized. Mike Hennessy, chairman of the Joliet club’s Rotary Foundation, noted this year’s foundation drive, to date, has surpassed the initial goal. 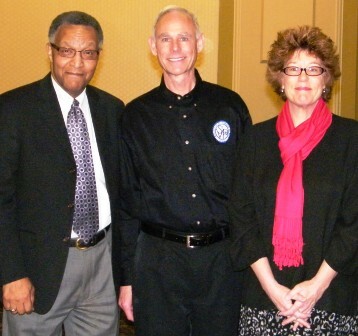 Rotary District 6450 Governor Nicki Scott paid a surprise visit to Joliet Rotary Club’s weekly luncheon. Her purpose: to present past Joliet Rotary Club President and current Assistant Governor Jane Hopkins with the District Rotarian of the Year award. 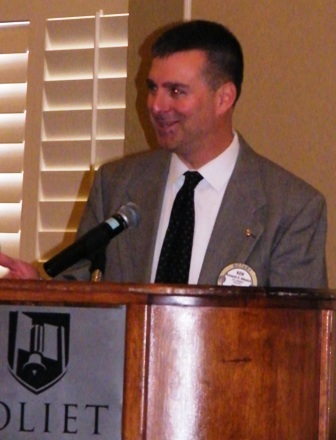 Scott also acknowledged Hopkin’s willingness to assume the trainer position in District 6450, the birthplace of Rotary, and create interesting content for the next generation of Rotarians. Hopkins joined the Joliet Rotary Club in 1999 and has served as Assistant Governor since 2012. 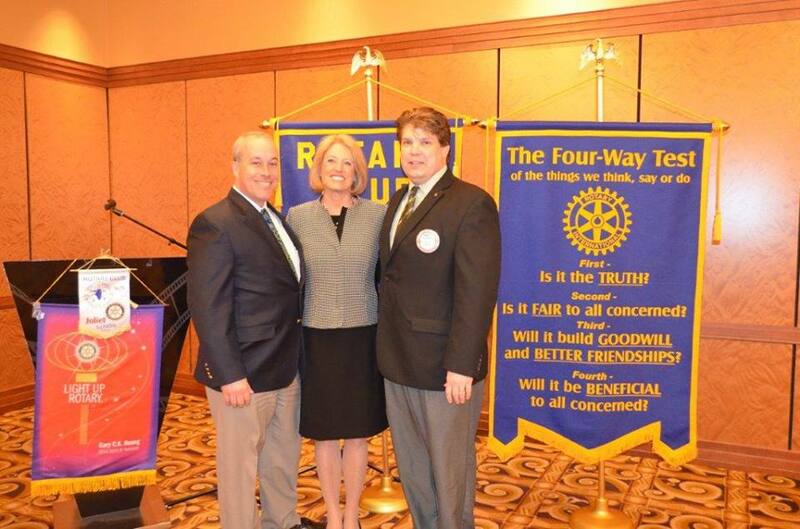 We were happy to welcome newly appointed Illinois Comptroller (& Joliet native) Leslie Geissler Munger to speak at the Joliet Rotary Club, in April. REMINDER: The Rotary Club of Joliet's membership database (including email addresses) on ClubRunner is to be used for official Rotary Club business only. 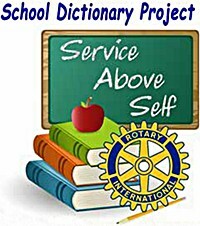 On the morning of Wednesday, Feb. 18, we will conduct our 2015 Rotary School Dictionary Project. We can use all the help we can get. If you are available, please contact Dan Mihelich or Charles Coleman. Thanks to everyone who participated in the "Predictions for 2017" while Ed Dollinger was Sergeant-At-Arms on Tuesday, January 10th. Over 35 Rotarians participated. If you are still interested in participating, please answer the following questions by February 15th. Send to edward.dollinger@edwardjones.com or fax to Ed at (888) 265-2884. What will the Dow industrials return in 2017, including dividends? What will be the year’s biggest financial surprise? Trump is bad for stocks. S&P 500 falls over 10%. Gold glitters and rises to more than $1,500 an ounce. Strong U.S. economy lifts U.S. 30-year bond yields to over 4%. Emerging-market stocks rally, MSCI index gains 15% or more. Bear market in crude oil. WTI ends year below $40 a barrel. Where will oil prices (WTI) finish 2017? Oil traded last week around $53 a barrel. What will happen in Washington with taxes? Corporate tax rate is cut to 25% or lower. Top personal rate is reduced to 33% or lower. Carried interest loophole is eliminated. Where will the 30-year T-bond end 2017? It recently yielded about 3.1%. Where will the Dow industrials end 2017? The index closed on 01/06/2017 at 19,963. Damon Sloan is nominated as Vocational Service Director for a two year term, 2015-2017. John Spesia is nominated as International Service Director for a two year term, 2015-2017. Joliet Rotarians are invited to suggest a local community worthwhile project in need of funds. The 2014 Joliet Rotary Raffle Project selection process needs your input. Applications are now welcome. Deadline to submit your project suggestion is March 3, 2015. If you are in need of an application form, please contact: Dave Thornton, 815-690-1523, dthornton0714@hotmail.com or download here. 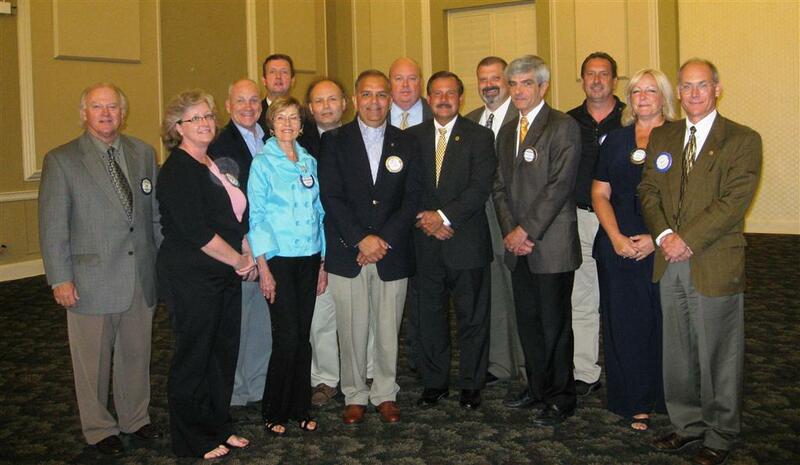 Each project must be sponsored by a member of the Joliet Rotary Club. If the project is selected, that member, along with a representative of the organization or group, shall monitor the progress and report on the implementation. The specific project must be clearly identified including the Rotary Club of Joliet recognition plan. ​The project will be funded up to $30,000. These funds are available as a result of the Annual Rotary Raffle Fundraising Event. Each year the anticipated dollar amount will be determined by the Board of Directors. The Rotary Member sponsoring the project should return the application and supporting documentation to Past President Dave Thornton, or current President Bret Mitchell by Tuesday, March 3, 2015. Last week, the Students of Service/Rotary Interact Club at Joliet Township High School, packaged meals at Feed My Starving Children in Aurora, IL. The Joliet Rotary Raffle Names 'Super Bowl' Champs! Congratulations to all members of the Joliet Rotary Club for a record season in the 2014 raffle. Our raffle sales exceeded $51,000! Special congratulations to Captain Jeff Pierson and his New Orleans Saints for selling 66 tickets. The Saints are this year’s Rotary Raffle Super Bowl Champions! Our AFC champions were Kate Schott and her L.A. Raiders with 48 tickets sold. This year’s MVP went to Bob Filotto with 56 tickets sold. In second place, Paul Morimoto sold 16 tickets; third place is Laurie Rambo selling 15 tickets; fourth place Jennifer Howard 13 tickets and fifth place to Ed Dollinger selling 11 tickets. Nearly all of our club’s members met their ticket sales obligation. A well deserved shout out to the Raffle co-chairs Ann O’Neill and Rich DeGrush. They were the true leaders in this year’s raffle. Ann kept excellent records of the tickets sales and even delayed her annual migration to Arizona to help wrap up the raffle season. Rich did an outstanding job coordinating the Kangaroo Court and helping keep the motivation high during the entire season. Bob Filotto honored with a Rotary Raffle MVP award for being the top raffle ticket seller for many years! Top Rotary raffle sellers: Laurie Rambo (3rd place), Ed Dollinger (5th place) and Jen Howard (4th place). Raffle co-chairs Anastasia Tuskey and Rich DeGrush and President Brett Mitchell acknowledge top Team Captain Jeff Pierson; while Jane Condon & Andy June collect their winnings! $10,000 Rotary Raffle winner Mike Hansen thanks the club and announces he is donating $1,000 back to the Joliet Rotary Club. JOLIET – Rita B. Garman was traveling through Will County on Christmas Eve more than 40 years ago when she heard WGN radio announce that “a woman” had been appointed as a judge in downstate Illinois. 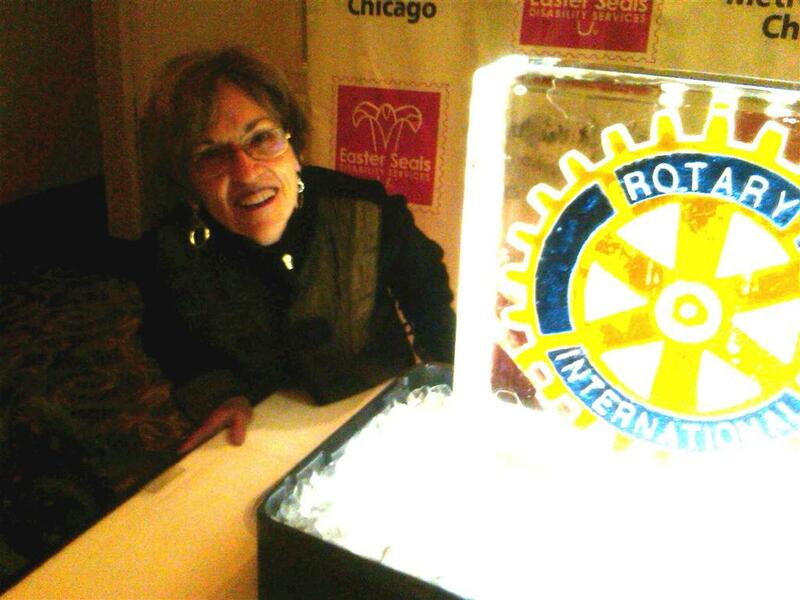 “And I knew who that was,” Garman recalled Tuesday to a room full of Joliet Rotary Club members at Hollywood Casino. Each week, prizes will be awarded to the top sellers in each conference. Raffle sales will end on Oct. 21. The “Super Bowl” champions (the top selling team) and the MVS (most valuable seller) will be awarded a special prize. Additionally, there is the Ultimate Challenge: outselling the defending Super Bowl Raffle Champions Seattle Seahawks, a 5 member team led by our Joliet Rotary President Bret Mitchell! Every Rotarian is expected to sell at least three tickets. The proceeds from this annual raffle help to fund the club’s service projects. Any questions can be directed to Anastasia Tuskey, Ann O’Neill, or Rich DeGrush. 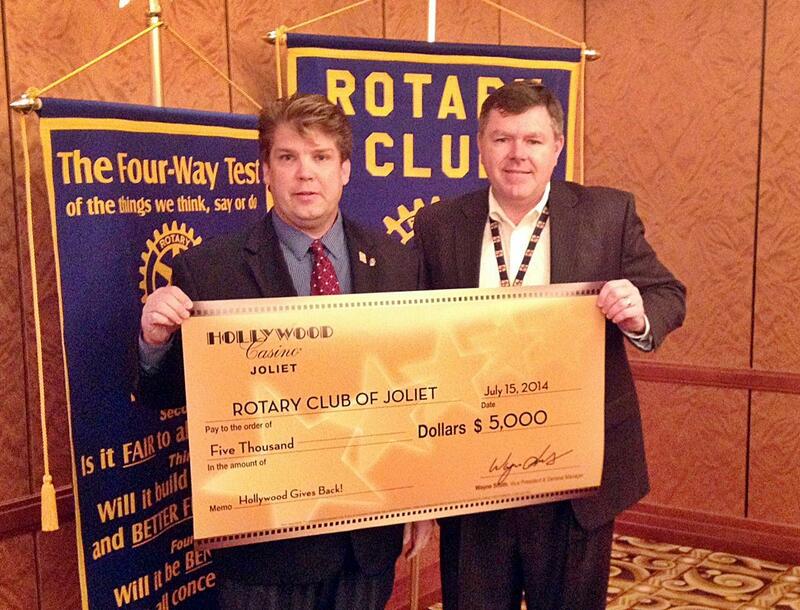 Thanks to Hollywood Casino Joliet general manager Wayne Smith for this generous donation to the Rotary Club of Joliet! JOLIET – If you are the victim of identity theft, the attorney general’s office can help you. “But it’s so much easier to take steps to prevent you from being the victim of a scam than try to clean up [your credit rating] afterward,” Lisa Madigan told members of the Rotary Club of Joliet during a meeting Tuesday at Hollywood Casino in Joliet. What is Rotary? If I asked each of you, I would probably get a different answer. However, to me, it is the leading humanitarian organization in the world. As an organization, we have the ability to change lives on a local, national and global scale. In 1905, Paul Harris and 3 other businessmen gathered in Room 711 of the Unity Building in downtown Chicago. This was the first Rotary Club meeting. These men initiated a "rotating" meeting in order to experience fellowship and undertake community service. Today, all of us continue that enduring tradition. I am proud to say that Rotary International leads the world in volunteer service. It consists of 1.2 million members in 34,000 clubs, in over 200 countries. But, Rotary is not about numbers...it is about service. In the past year, I have been fortunate to discover, through President-Elect Training and District events, the true scope of the work that Rotary does on a local, national, and international scale. 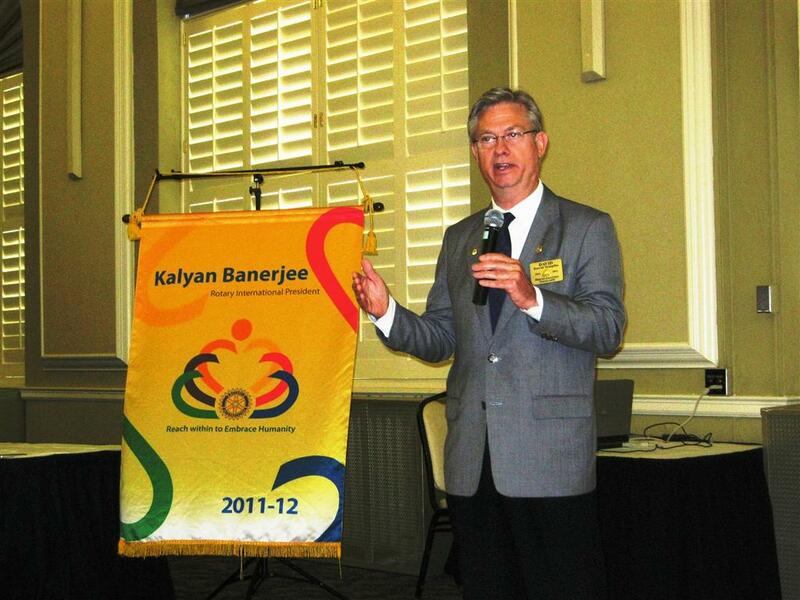 Rotary International has identified specific causes to target in order to maximize our local and global impact. 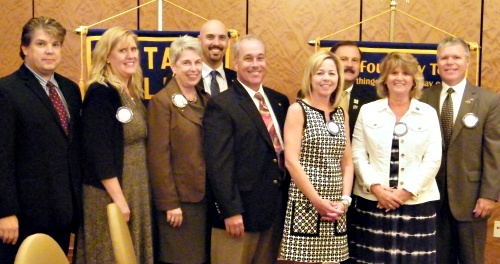 Joliet Rotarians who have contributed more than $1,000 to the Rotary Foundation were recently recognized as Paul Harris Fellows. 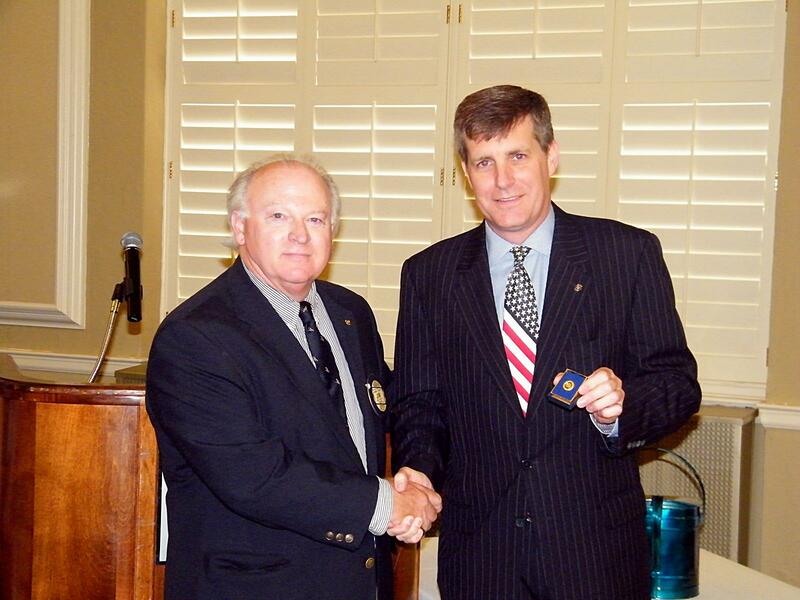 A Paul Harris Fellow receives a special certificate and a gold pin. Multiple-time Paul Harris Fellows are recognized as they continue to contribute. Last week, George R. Block Sr. and Ruby Williams were honored with the Rotary Club of Joliet’s Silver Eagle Award for volunteer service Created for seniors 65-years-old and older, the award recognizes those individuals who have demonstrated “going beyond the call of duty” by providing volunteer service and leadership to the community. Please note: the December 24th and December 31st meetings will be cancelled due to the holidays. Many thanks to everyone who sold and purchased tickets to support local charities selected by the Joliet Rotary Club! 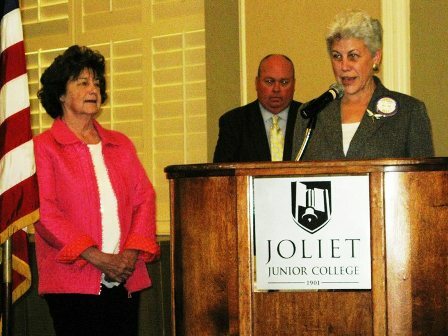 Silver Eagle Award committee chair Roxane Geraci Militello is seeking nominations for the Joliet Rotary Club's notable Silver Eagle Award, honoring seniors 65-years-old and older for volunteer service and leadership. APPLICATIONS MUST BE RECEIVED BY OCTOBER 1. Nominees must reside or perform volunteer service in the City of Joliet - and demonstrate “going beyond the call of duty” as a volunteer. Individuals may be nominated by a Rotarian - or an organization may nominate an individual, through a Rotary Club sponsor. 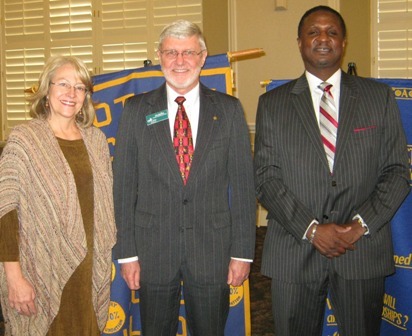 Pictured: Rotarian Carol Andrew, Club President Dave Thornton welcomed Father Phillip Mbeta at the August 20 meeting. Father Phillip Mbeta shared information about the Malawi water project that was organized by Lori Spesia and Rotarian John Spesia. John also gave a detailed report of a proposed project to help renovate a school in Malawi. Rotary International has changed millions of lives around the world. 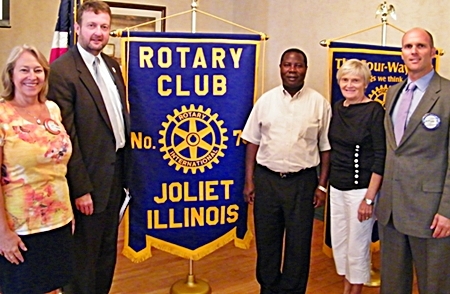 And while it may be difficult to comprehend the number of people the organization helps, the Rotary Club of Joliet has a direct relationship with a village in Africa where the results of our donations can be seen firsthand. Through a relationship with Father Phillip Mbeta, a priest who served at St. Mary Immaculate in Plainfield, the Rotary Club of Joliet has helped build three wells in Blantyre, Malawi. John Spesia met Father Mbeta and quickly learned of the needs of his village in Malawi. John quickly connected the Rotary slogan, “Service Above Self”, with an opportunity to help the people of this village. Members of the Joliet Township High School 204 Interact Club had a great time at the Joliet Rotary Club's 100th Anniversary Centennial Gala featuring Rotary International President Ron Burton. 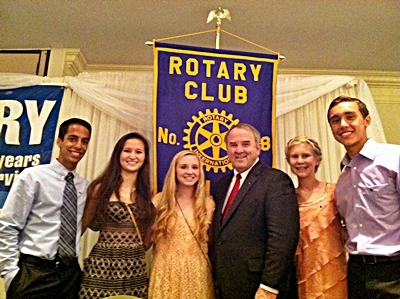 Putting Rotary's "Service Above Self" motto into action, the students volunteered to help with various jobs that night! A 'Once in a Century' Event! A great time was had by all in attendance at our club's 100th Anniversary Centennial Celebration Dinner featuring Rotary International President Ron Burton on August 3, 2013. Our thoughts and prayers go out to the family and friends of former Joliet Rotarian & Club President (1985) William C. Wunderlich. Funeral services are available here. 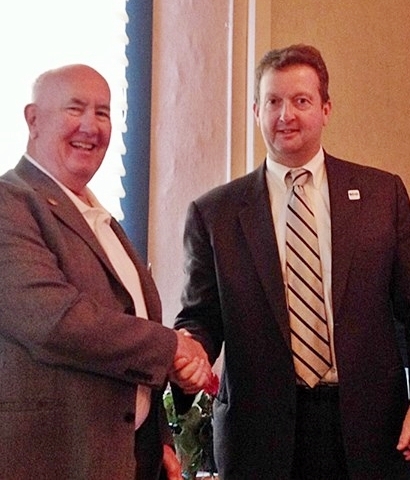 President Dave Thornton congratulates Joliet Rotarian Jim Costello for reaching the Paul Harris +7 level of giving! 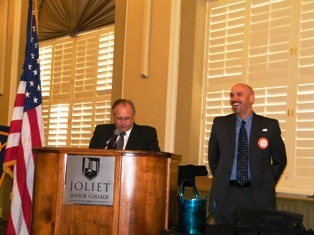 President Dave Thornton congratulates Joliet Rotarian Bruce Konzelman - a new Paul Harris Fellow. Two new Paul Harris Fellows who were recognized but could not attend Tuesday's meeting were: Joseph Hammer & Thomas McGrath. 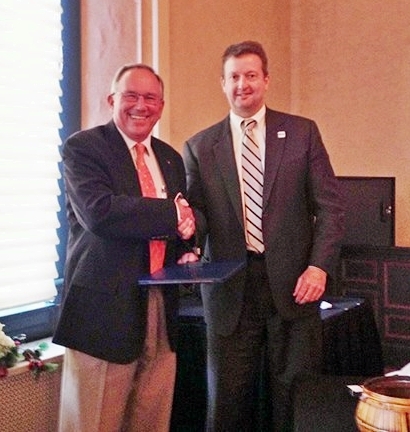 Dave Thornton (left) was installed as president for 2013-2014 by outgoing president Tim Brophy at the June 25 luncheon. 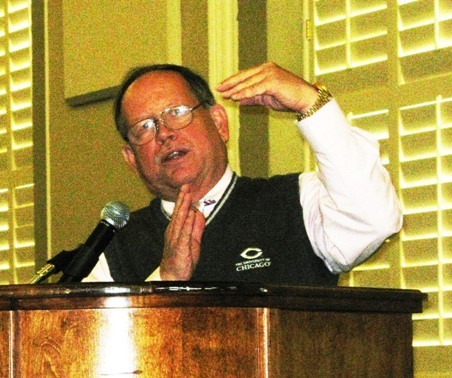 Brophy will serve another year on the board as past president. Thornton outlined some of his goals as president which include member retention and attracting new members. 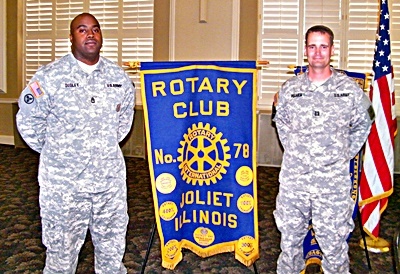 Thornton is following in his father’s legacy; Bob Thornton served as president of the Joliet Rotary Club in 1975-1976. President Tim Brophy (right) presented member James V. Smith with a Paul Harris 2+ at the June 25 luncheon in recognition of his generous contributions to the Rotary Foundation. Donations to the Rotary Foundation enable Rotarians to complete humanitarian and educational projects worldwide. Congratulations to our 2013 Paul Harris Fellows: Rev. Jim Allen, Bret Mitchell, Kathy Giegerich, Bill Kaplan, Miriam Merrill, Jim Slager, John Spesia, Jack Rogers and James V. Smith! THANKS TO OUR CENTENNIAL SPONSORS! Rotarians Invited to Light Up the Holidays Parade! All Rotarians and their families are invited to participate in the Joliet Rotary Club's entry in the 'Light Up the Holidays' parade, this Friday, November 23, 2012. What a great way to celebrate and promote our Centennial Year! Come early for some pre-parade socialization and cocktails at 3PM at The Department, 205 N. Chicago St., Joliet. If you can't come early, meet the group at the 5PM line-up. The Joliet Rotary Club entry is #64. Questions? Contact Mike Rittof at 815/671-0550. 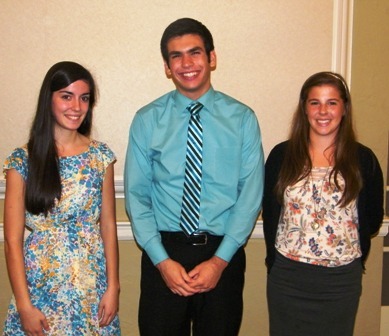 The Rotary Club of Joliet honored the Students of the Month during the Sept. 4 luncheon. From left to right Kaitlin Contos, Frank Bruno, and Jacklyn Long. Kaitlin Contos attends Joliet West High School. She is the daughter of Michael and Charleen Contos. Kaitlin plans to attend Southern Illinois University at Carbondale to study accounting and finance. She is the niece of member Tony Contos. Frank Bruno attends Joliet Catholic Academy. He is the son of Michael and Mary Lynn Bruno. Francis plans to study political science and journalism in college. Jacklyn Long is a student at Joliet Central High School. She is the daughter of Brian and Joan Long. Jacklyn is currently taking dual credit classes at JJC and plans to transfer to the University of Chicago to study medicine. 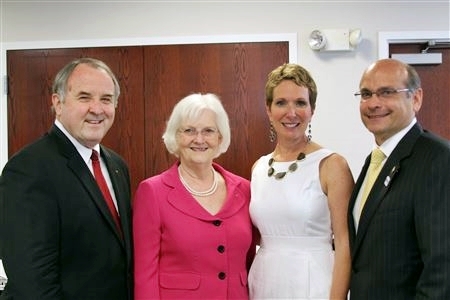 The Rotary Club of Joliet has a new slate of officers. 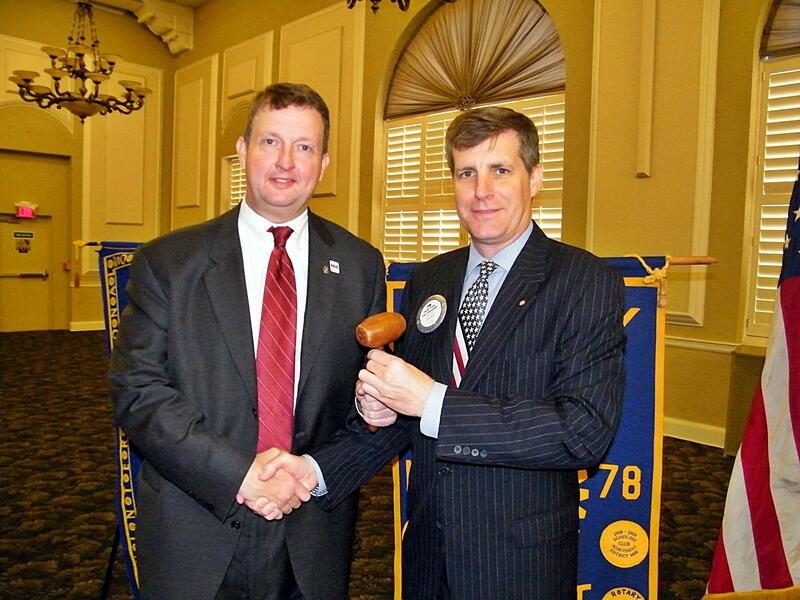 At the June 26 meeting, Tim Brophy was sworn in as the club’s new president. Other new officers include David Thornton, president elect; Brett Mitchell, vice president; and Dan Malinowski, secretary. 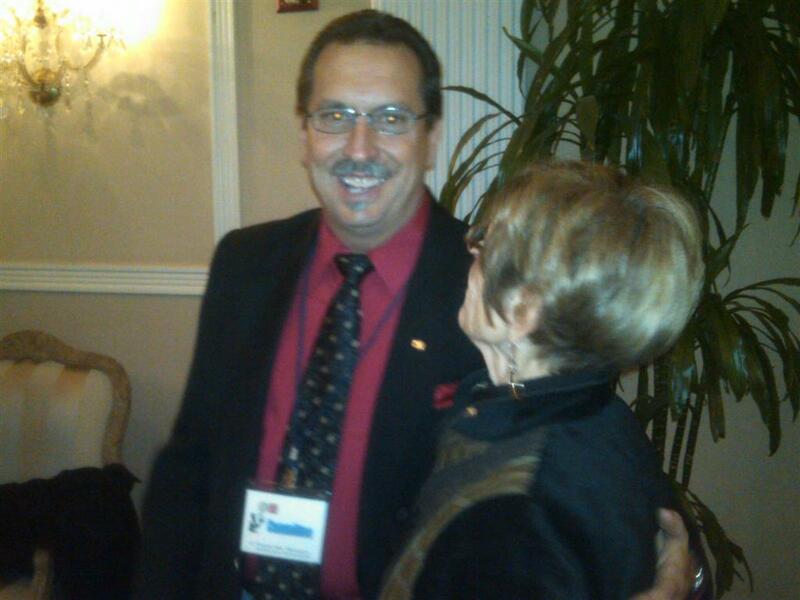 Mark Griglione will continue his service as treasurer. 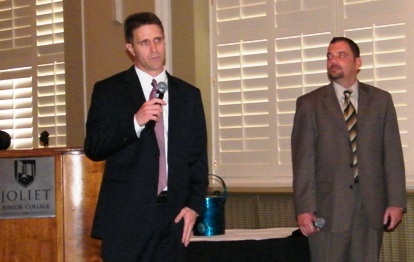 Two new directors were also installed Tom Grotovsky and Laurie Rambo. Cathy Molck and Bill Jenkins will serve another year as directors. 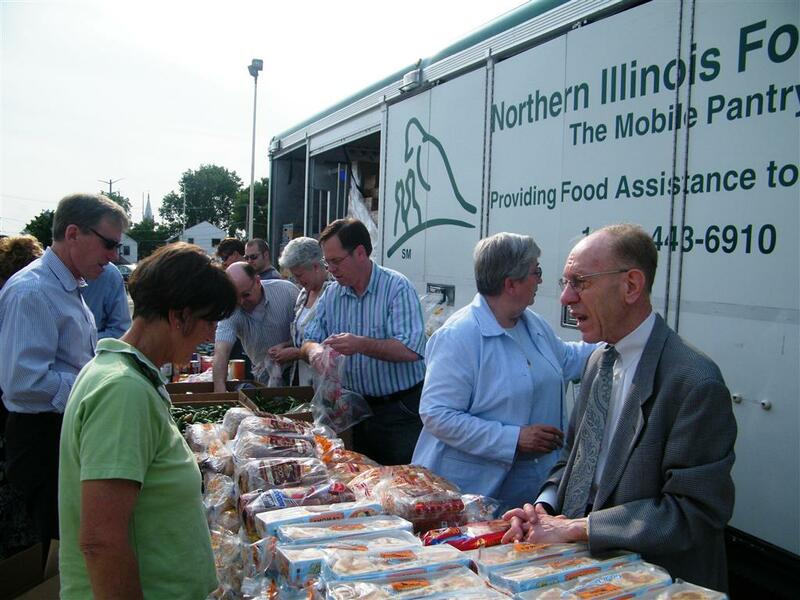 On Tuesday, June 12, the Joliet Rotary Club sponsored a mobile food pantry from the Northern Illinois Food bank. The event was held at the Warren Sharp Center in Joliet. A great display of hard work and a spirit of helping our neighbors in need was front and center. In all we were able to serve 167 households which accounts for 664 individuals. 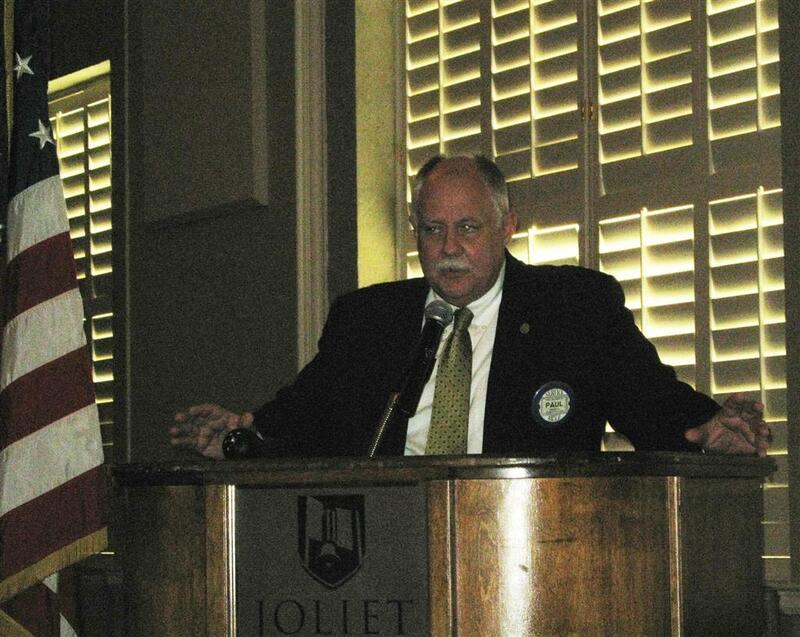 At the May 1st meeting, Ken Mihelich shared details about one of the first meetings of the newly formed Joliet club. Eighteen members and two guests met on April 13, 1913 at the Hobbs Hotel in Joliet with Chairman Maurice Lennon presiding. Judge Charles Campbell of the 12th Illinois Circuit Court gave a speech about success. He enumerated several characteristics of success including good habits and good morals. Judge Campbell said, “No success can be achieved except by honorable means. The one essential for success is energy and endurance.” These are ideals still held high by Rotary clubs today. 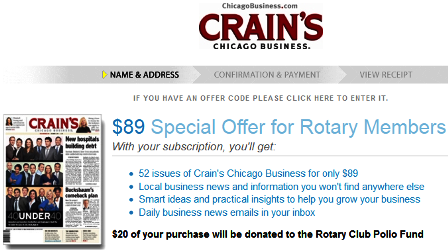 Take advantage of this special offer from Crain's Chicago Business - with your subscription, they will make a donation to Rotary International's Polio Plus campaign to eradicate polio in the world. 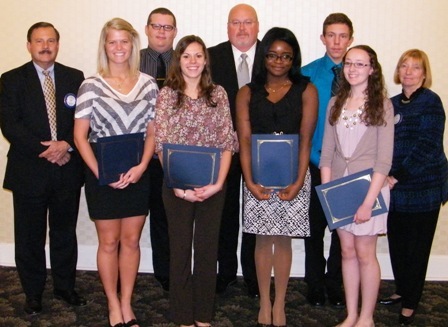 The Rotary Club of Joliet awarded six scholarships to local graduating students for the 2012-2013 school year. Pictured are : Katelyn Gannon, Benjamin Fox, Nicole Formhals, Adjo Tameklo, Samantha Marconi, and Kyle Teegardin. Also pictured are members of the scholarship committee Mark Griglioni, Mike Murray, and Ann O'Neill. Proceeds from the club’s annual fundraising efforts support this scholarship program. Student applications are solicited from Joliet Central, Joliet West, and Joliet Catholic High Schools. Joliet Rotarian Russ Slinkard was one of many club members who participated in this year's Dictionary Project, organized by fellow club member Ricardo Espinoza. 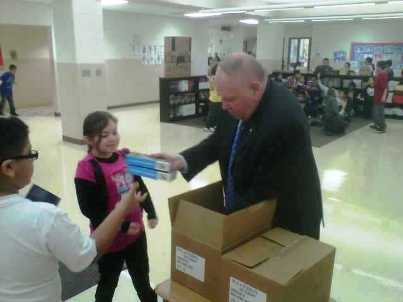 Rotarians talked about Rotary and the 4-Way Test, as well as the importance and use of dictionaries to 1,278 Joliet Public SD #86 and Rockdale SD #84 fourth grade students. Each student received their own, brand new dictionary! 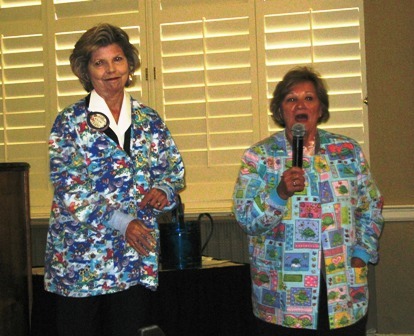 Club members heard first-hand from each of them at last Tuesday's meeting. After the presentations, members were emailed online voting instructions from Bill Jenkins, to select who will be the recipient of up to $10,000 in Rotary Raffle proceeds. Rotarian John Spesia is pleased to report that the Malawi Clean Water Project is completed! The project began after Joliet Rotarian Doug Spesia's death in 2010. A memorial fund was started to construct the Douglas Spesia Centre in Thyolo, Malawi. The village was in need of a clean water source because water-related illnesses such as cholera and typhoid, are common due to the lack of access to clean water. 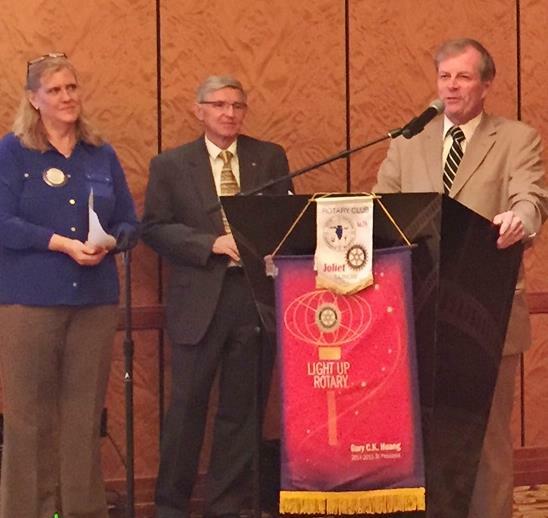 Recognizing this need, the Joliet Rotary Club stepped in to help. On July 21, 2011, the Board of Directors of the Joliet Rotary Club approved funding to construct a deep well at the site of the Douglas Spesia Centre to provide clean water for the people of Thyolo. Below is the letter from Fr. Philip thanking the Joliet Rotary Club for the well that we constructed in Likwakwanda, Malawi. The Holiday Cheer Committee would like to thank all Joliet Rotarians for their ongoing generosity and support of the food and necessities collection program. Also thank you to the all great volunteers who’ve come together to ensure the program’s success. Holiday Cheer committee members Tom Grotovsky and Laurie Rambo enjoy themselves as they help out with the weekly collection. 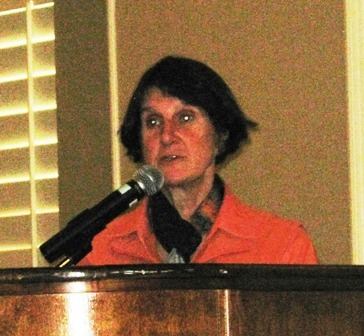 At a recent club meeting, Joliet Rotarians listened as Hester Bury, director of the Northern Illinois Food Bank (NIFB) spoke about their mission to provide nutritious food to those in need, through their work and with 600 partner agencies in 13 Northern Illinois counties. Joliet Rotary Welfare Committee Chair John Spesia presented a check to Christine Bzdon and Victoria Collett of the Child Care Resource and Referral (CCR&R) agency to help purchase winter coats for over 100 children from 3-to-5-years-old. Global understanding of environmental sustainability is a key focus for Sebastien Magnan, Rotary Ambassadorial Scholar and student at the Illinois Institute of Technology (IIT) Stuart School of Business. A recent guest at the Rotary Club of Joliet meeting, Magnan spoke about his experiences as a Rotary Scholar and also shared parts of his home and family in a presentation on Being a Rotary Ambassadorial Scholar. 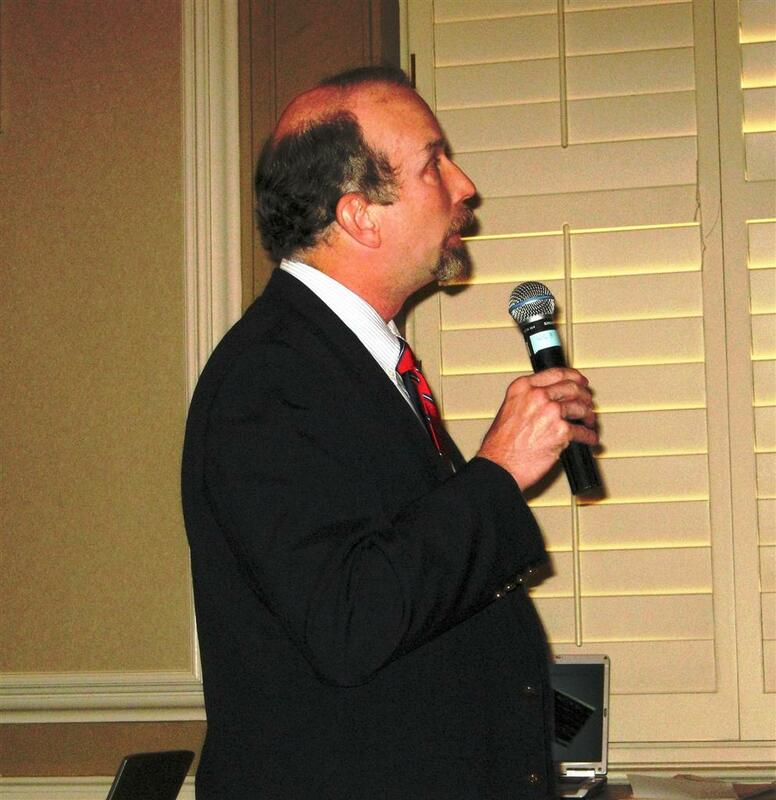 Joliet Rotarians recently heard the poignant story of author Sal Di Leo, who credits the Sisters of Saint Francis Mary Immaculate in Joliet for making a difference in his life. A number of Franciscan Sisters, including Rotarian Sister Mary Frances Seeley, proudly cheered him on. It was all about oil – “black gold”, “Texas tea”… at a recent Joliet Rotary meeting when Jay Bergman, President and CEO of Petco Petroleum Corporation, gave members food for thought while presenting, “You Think $4 per Gallon is Expensive? Wait Until Next Year.” As President/CEO of the independent oil and natural gas producer headquartered in Hinsdale, IL., Bergman gave the group insight on how gas prices are determined and what to expect at the pump in the future. 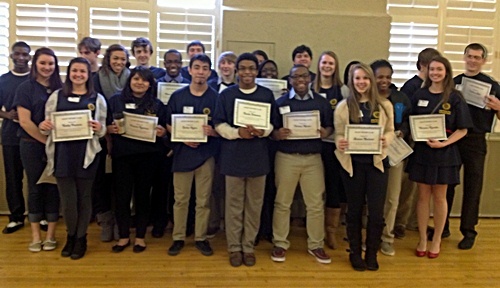 Joliet Rotarians were honored for perfect attendance at a recent Club meeting at the Renaissance Center. The Club meets on a weekly basis and if missed, members may attend make-up meetings at other Rotary Clubs. Ranging from 1-to-33 years of perfect attendance, members include: George Buck (33 years); Jim Smith (20 years); Miriam Merrill (19 years), Dan Vera (18 years); Mike Rittof (12 years); Greg Peyla (11 years); Jane Hopkins (6 years); Art Galli (5 years); Dan Mihelich and Dave Thornton (4 years); Mark Griglione (3 years); Tom Grotovsky and Bill Kaplan (2 years); and Mike Murray and Laurie Rambo (1 year). "Getting Your Garden Ready for Bed” was the subject of an informative and humorous presentation at the August 16 Joliet Rotary Club meeting. University of Illinois Extension’s Will County program coordinator and master gardener, Nancy Kuhajda, gave helpful and interesting tips on how to get rid of garden pests; grow healthy flowers and vegetables; and how to prepare for next year’s crops. Joliet West High School’s Students of Service (SOS) recently formed an Interact Club with the Rotary Club of Joliet in order to work hand-in-hand on service projects for the community. At a recent Joliet Rotary meeting Joliet West students, Asha Reynolds, Haley Salazar, Anthony Schalk, and Frank Spesia sold 50/50 raffle tickets to club members with half of the proceeds going toward a new tee-shirt design for their student club. Governor David Templin, Rotary District 6450 (2011-2012) spoke to Rotary Club of Joliet members during their August 9 club meeting at the Joliet Renaissance Center. He spoke passionately about making the transition from Rotary Member to Rotarian. 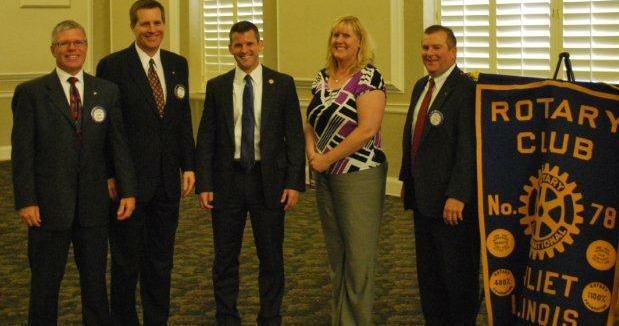 U.S. House Representative (IL-11), Adam Kinzinger spoke to Joliet Rotarians about current issues effecting the district and U.S. Congress. He spoke about some of his positions on several key issues now in discussion by the House and Senate – and briefly, gave his thoughts on the redrawn district map and his desire to continue representing the district. Following his presentation, Rep. Kinzinger addressed questions during and after the club’s meeting. More than 150 families benefitted from a stop last week in Joliet of the Northern Illinois Food Bank’s Mobile Food Pantry. The Rotary Club of Joliet hosted this event which offered fresh meat, fruit, baked goods and other dry staples to needy families in the area. 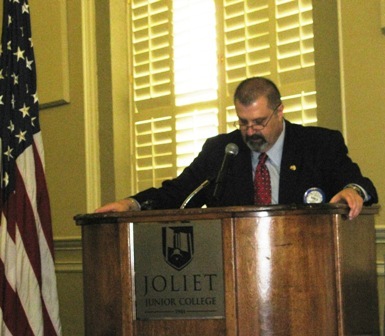 As speaker at a recent Club meeting, Joliet Rotarian Dr. Paul Swantrom reflected on his years as superintendent at Joliet Township High School District 204 – and his June 30th retirement. After serving at the helm of the large high school district for nine years, Dr. Swanstrom spoke of progress and issues in education, not only at Joliet Central and West High Schools, but throughout the country. As co-chairs of the Rotary Club of Joliet Centennial Committee, Mike Rittof and Ed Dollinger spoke of plans for the Club’s 100-year celebration at a recent Club meeting. They also introduced Centennial subcommittee chairs who briefly spoke of their roles. The yearlong celebration will begin August 2012 and extend to August 2013, and will include several special activities, including an exhibit at the Joliet Area Historical Museum. 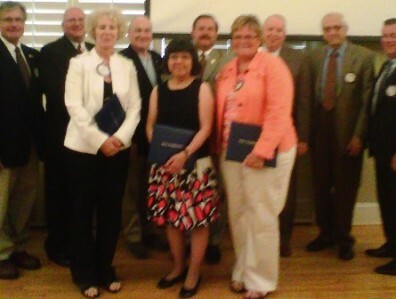 Sixteen Joliet Rotarians were recently recognized for obtaining various levels of giving as Paul Harris Fellows. Part of the Rotary Foundation of Rotary International, the Paul Harris Society is named after the founder of Rotary International and recognizes friends of The Rotary Foundation who contribute $1,000 or more to the Annual Programs Fund, PolioPlus, and other approved Foundation grant activities. Sharon May, chair of the Joliet Rotary Welfare Committee presented donations to JoAnn Nault of Grace Child Care Center at Grace United Methodist Church, Marilyn Farmer of Morning Star Mission, and Amanda Quinn of Joliet Junior College. At a recent Rotary Club of Joliet luncheon meeting, six high school seniors were awarded scholarships of $1,000 each for their academic achievements and community service. 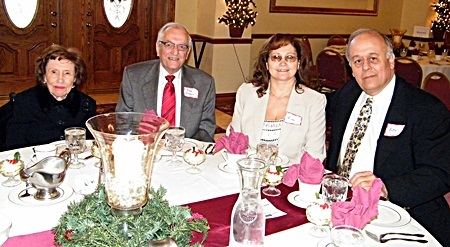 The Joliet Club offered $6,000 in scholarships to seniors graduating in 2011 from Joliet Township High School Central Campus, Joliet Township High School West Campus and Joliet Catholic Academy. William A. Strauss, senior economist and economic advisor at the Federal Reserve Bank of Chicago, joined the Rotary Club of Joliet as guest speaker, providing the Fed’s outlook for the U.S. economy in the next few years. A handout of the slides used in the "Economic Outlook for 2011 and 2012" presentation is available for download on the Joliet Rotary Club website: click here. Brigadier General [Ret.] Patrick E. Rea, Village Clerk of Tinely Park, will explore the "Current Condition of the US Economy With a Closer Look at Illinois" at the March 29 Rotary Club meeting. All Rotarians and their guests are encouraged to attend this timely presentation. State Senator A.J. 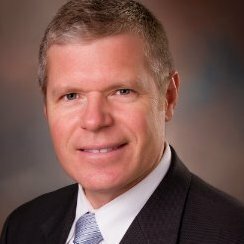 Wilhelmi (D-Joliet) will speak on the "Current Illinois Budget Crisis" at the Joliet Rotary Club lunch meeting on March 22, 2011 at 12 noon. All Rotarians and guests are encouraged to attend. Membership Orientation Committee chairperson Sam Mancuso introduced two new members to the club: Christopher Stayton of the Asset Care Team in Plainfield, and Lisa Kinser of Dystrup, Hoster & Jarot, P.C. in Joliet. 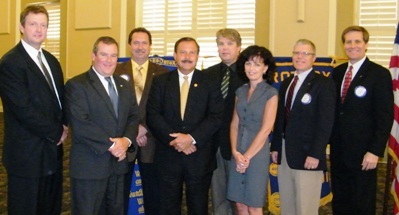 (Left-right) Jeff Plyman, Tim Brophy, Sam Mancuso, Chris Stayton, Lisa Kinser and Bob Filotto. Rotarian Miriam Merrill recognized club members for Perfect Attendance Tuesday, during the weekly meeting for the Rotary Club of Joliet. 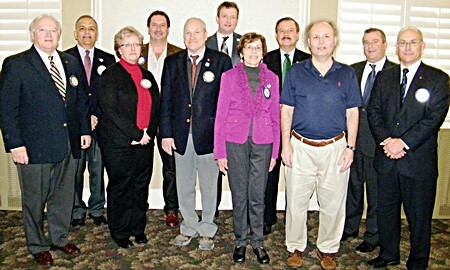 Rotarians honored for the 2009-10 year have perfect attendance ranging from 1 year to 32 years. Perfect Attendance recipients with President Mike Murray include (front row, left-right) Jane Hopkins, Miriam Merrill, Dan Vera, Mike Griglione, Tony Contos, Janet Markelz and Art Galli. (back row, left-right) Jim Smith, George Buck, Dave Thornton, Greg Peyla, Mike Murray, Mike Rittof and Tom Grotovsky. Come and join the fun at the Mardi Gras District Conference at The Blue Harbor Resort in Sheboygan. 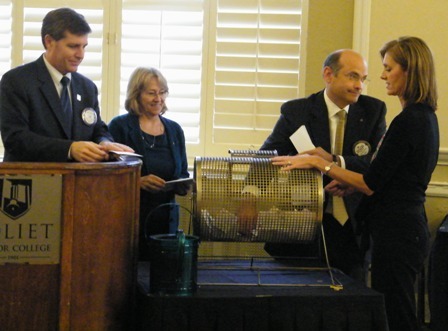 After much discussion, surveying the club members, and consulting with the Council of Past Presidents, the Board of Directors announces exciting new changes to the 2010-2011 Rotary Raffle! Our annual Rotary Foundation Drive ends at the conclusion of Tuesday's meeting. Mike Hennessy reports that 115 Joliet Rotarians have made a contribution in support of our Rotary Foundation. The Bylaw Committee presented a new set of bylaws for our club at last week's meeting. Club members will vote on the bylaws at the June 8th club meeting. 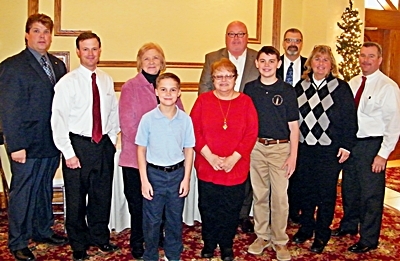 Five new members were inducted to the Rotary Club of Joliet on Tuesday, Feb. 4, 2010. The Rotary Club's centennial celebration will include several special activities, including an exhibit at the Joliet Area Historical Museum, spearheaded by Larry Johnson and Tony Contos. Past and current Rotarians and their families, as well as the general community, are encouraged to furnish historical Rotary items or artifacts for the exhibit. 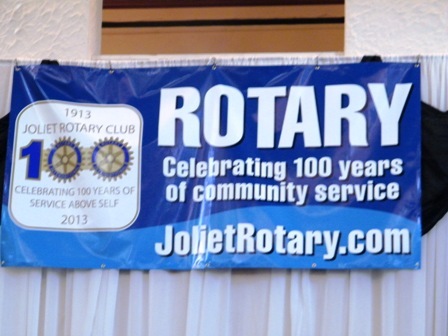 Under the direction of Co-Chairs Mike Rittof and Ed Dollinger, plans are underway for the celebration of 100 years of service by the Joliet Rotary Club. The yearlong celebration will begin August 2012 and extend to August 2013, and will include several special activities, including an exhibit at the Joliet Area Historical Museum. The Rotary Club of Joliet has awarded the Boys and Girls Club of Joliet a $10,000 check that will be used to provide funding for a new gymnasium floor for youth in the community. At a recent Joliet Rotary meeting, Lt. David Hausmann of the Joliet Fire Department spoke to the group about JFD’s Heartsaver classes. The lifesaving classes are offered by the department, along with other CPR programs. The program is in partnership with the American Heart Association. Nearly 12 years after the Columbine High School Massacre (April 20, 1999), the compassionate memory of Rachel Joy Scott, the tragedy’s first victim, came to Joliet Rotary with the help of Joliet Township High School’s YESS (Youth Experiencing Success in School) program. Will County Land Use director, Curt Paddock and Marta Keane, environmental coordinator, recently spoke to the Joliet Rotary Club on the new Will County Green program and web site. The Rotary Club of Joliet recently recognized Paul Harris Fellows who have donated $1,000 or more to help support the Rotary Foundation’s humanitarian and educational programs worldwide. Members are asked to contribute on a yearly basis. Mike Hennessey, club foundation chair acknowledged the new Paul Harris Fellows for the 2009-10 year. Former Rotary Club of Joliet president Mary Ann Egger presented Centennial Co-Chairman Mike Rittoff and Joliet Rotary Club President Tim Brophy with a $500 donation for our centennial celebration during the March 26 meeting. Mary Ann is currently a member of the Channahon/Minooka Rotary Club. Several members of the Channahon/Minooka Rotary Club attended last week's meeting to show their support of the Joliet Club's 100th anniversary. Read more in the Herald News article: click here. Also at the meeting, District Governor Elect Cliff Lyda spoke about the importance of Women in Rotary at the March 26 meeting. Every year, our club selects one local agency to receive a $10,000 donation. At the Jan. 28 meeting, the three finalist agencies gave presentations about their services and explained what our donation would be used for. Each member of the Rotary Club of Joliet is invited to vote for one agency to receive the funding. (Click here to download the ballot.) The voting will close on Tues. Feb. 12. Please email your choice to Dan Mihelich, raffle committee chairman, at dan.mihelich@firstmidwest.com. 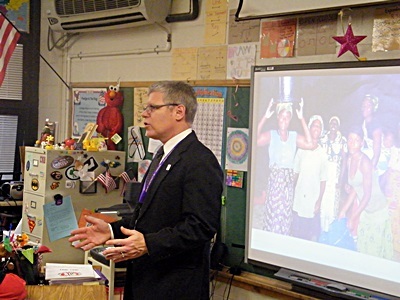 Rotarian Dan Malinowski tells students at Taft Elementary School in Joliet about the water projects the Rotary Club of Joliet is involved with during the annual dictionary distribution day. 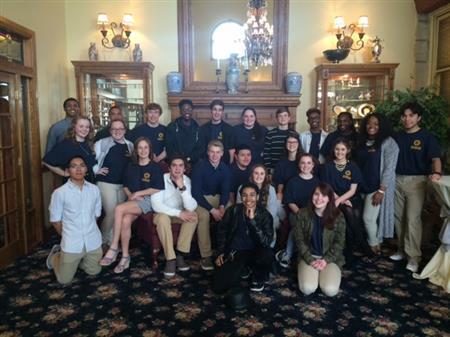 Twenty-seven students from the three Joliet high schools participated in this year's 17th Rotary Youth Leadership Seminar spearheaded by Mary Jaworski. 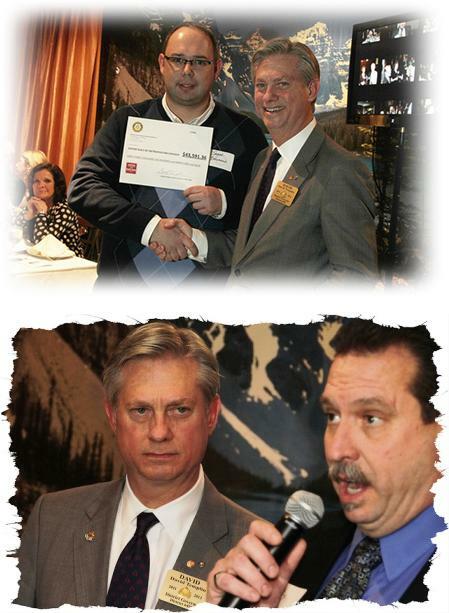 See more photos on the Joliet Rotary Club Facebook page. Photos courtesy of Anastasia Tuskey. A festive group of Rotarians represented the Joliet Rotary Club at last weekend's 'Light Up the Holidays' parade in downtown Joliet. Many thanks to the following Rotarians who participated: Ed Dollinger, Mike Rittof, Jane Hopkins, Cheryl McCarthy, Brian Hopkins, Tom Grotovsky, Bill Lauer, Rick Gregg, Tim Brophy, Dave Thornton, Dan Malinowski and Anastasia Tuskey. Special thanks to Ed Dollinger for providing the photos below. 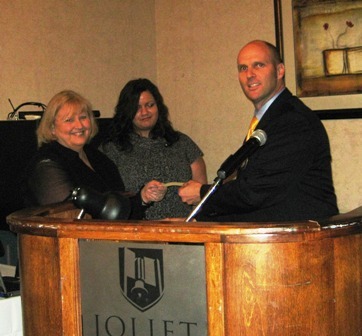 The lucky winners were chosen at last week’s meeting of the Rotary Club of Joliet. Ed Dollinger assisted raffle committee chairs Mary Beth Clausen, Laurie Rambo, and Carol Andrew in selecting this year’s winners. The annual raffle helps raise funds for the various projects the club supports each year. This year’s winner of the $10,000 grand prize is Sara and Cindy Shutts. Second prize winners of $1,000 each include Reid Filotto, Jackie McTee, Doug and Dave Anderson, Erin O’Sullivan, and Bob Hammack. Third prize winners of $500 were Beverly Holt and Michelle Rubovitz. Top ticket seller was Bob Filotto who sold 27 tickets. On November 8, Rotarians from District 6450 will join together with Hines and Jesse Brown VA, veteran organizations, and community based organizations to provide services to support the homeless veterans throughout the Chicagoland area. Rotarians will be providing and fitting the homeless veterans with coats, hats, gloves, and other clothing and blankets for the winter. and other conditions that can result from war. At this time we are seeking new or gently user winter coats (no leather or fur please, sizes large and XL preferred), hats, gloves (with leather or Poly palms) and long underwear for November 8 Stand Down Day. We know that in 2011, 850 homeless veterans turned up for the November Stand Down Day and the veteran organizations only had 75 coats to provide to the 850 homeless veterans. In an effort to make sure that this shortage does not occur again, we at the Joliet Rotary Club are committed gathering as many coats, hats and gloves as possible. Our deadline for collection is October 30th. Below you find a list of local businesses who have agreed to be a drop off site for the winter items. You may also bring these items to our weekly meetings. If you are interested in volunteering for the event on November 8th in Chicago or if you would like to help us locally with pick-up from our drop off sites please contact the Joliet Rotarians below. The District has also set up the ability for you to give a monetary donation online via their web site. Please click here to visit their donation page. 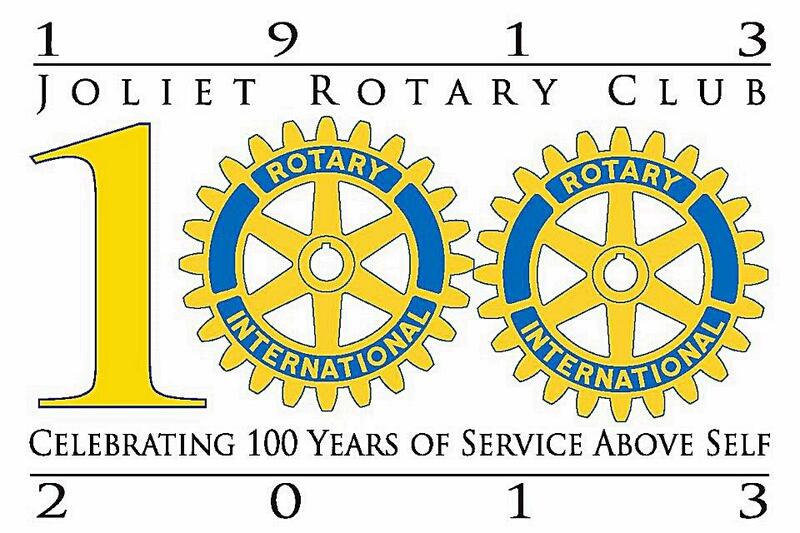 As one of the oldest clubs in the Rotary organization, the Rotary Club of Joliet is embarking on a year-long celebration to mark the 100th anniversary of the club’s founding. Amidst a festively decorated ballroom, Club President Tim Brophy officially kicked off the celebration of “Service Above Self”, the motto of Rotary International, at the July 17 meeting. 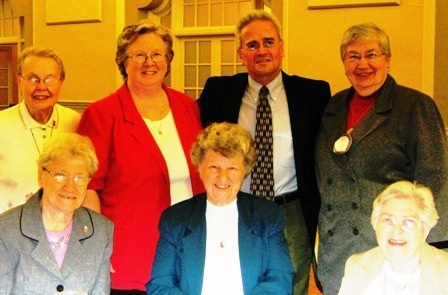 Our club was the first Rotary club in a community of less than 70,000, Brophy said. “Thousands of members have passed through our club in the last 100 years and we are proud of our rich history and the impact our club has had on Joliet and the world. The Centennial committee is led by co-chairs Mike Rittof and Ed Dollinger and the following subcommittees and chairs: History and Video - George Buck and Greg Peyla, Museum Exhibit - Tony Contos and Larry Johnson, Dinner Gala - Rick Gregg and Dan Vera, Public Relations: Debbie Condotti and Lisa Morel Las, Centennial Projects/Special Events: Howard Hamilton and Ken Mihelich, Sponsorship/Fundraising: Mary Jaworski and Russ Slinkard. 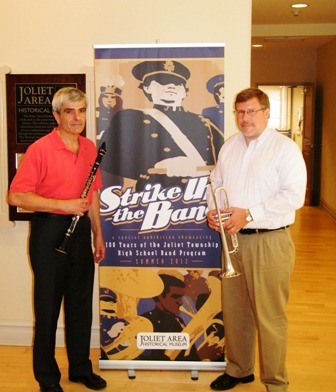 Rotary Club of Joliet members, Tony Contos and Howard Hamilton will kick‐off the Club’s centennial year by joining the Joliet Township High School (JTHS) Band as they also celebrate their 100th year during a special concert on July 29. 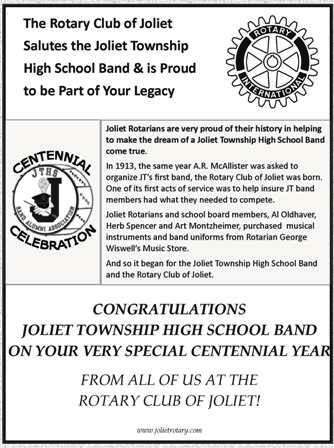 However, it’s no accident that Contos and Hamilton are playing in the concert celebrating the JTHS Band’s Century of Musical Excellence, nearly 70 band alumni will be joining them as well. Both Contos and Hamilton men are deeply rooted in the JTHS community as band alumni. 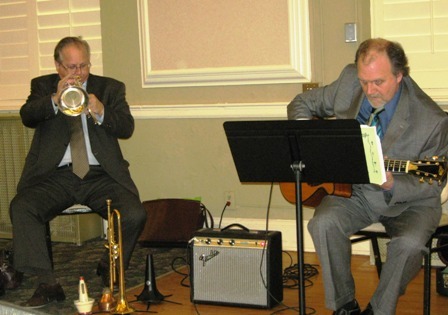 And both men are also members of Joliet Rotary, where one of its first acts of service was insuring the newly organized high school band had the necessary tools to compete. 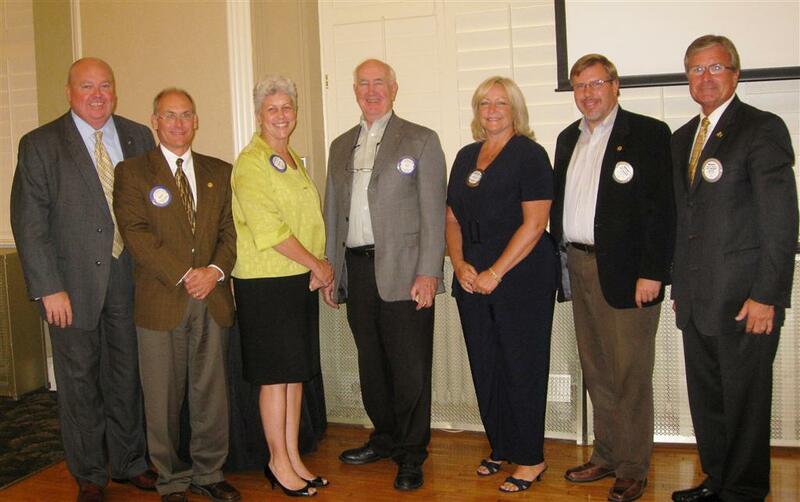 At the June 18 meeting of the Rotary Club of Joliet, six members were recognized for achieving the Paul Harris Fellow Level of Giving by the club’s foundation chairman Mike Hennessy. The Paul Harris Fellow award was established to honor members who contribute $1,000 or more annually to the Rotary Foundation program. Jane Condon, John Gallo, Bill Jenkins, Dan Kuska, Kristin Mulvey and Rhonda Sykes were recognized with a certificate and a plaque for their financial commitment to Rotary. Another four members were acknowledged for their contributions of $2,000 with the Paul Harris + 1 Level of Giving. They are George Buck, Marilyn Farmer, Mark Griglione and Russ Slinkard. Pete Nichols received a Paul Harris + 2 Level of Giving of $3,000 and Craig Wright was recognized for his donation of $4,000 with a Paul Harris + 3 Level of Giving. In the spirit of service above self, several members of the Joliet Rotary Club participated in the Easter Seals 17th Annual Celebration of Giving Telethon. The live local broadcast highlighting local talent, Easter Seals direct service to children and adults with disabilities, and staff, volunteers and supporters, generated more than $190,000. Thanks to Michelle Cottrell, Rich Hagen, Kathyrn Brand who joined Debbie Condotti on the Rotary VIP Phone Team. Additionally, Larry Johnson served as a show host, and Ed Dollinger and John Spesia were show sponsors. 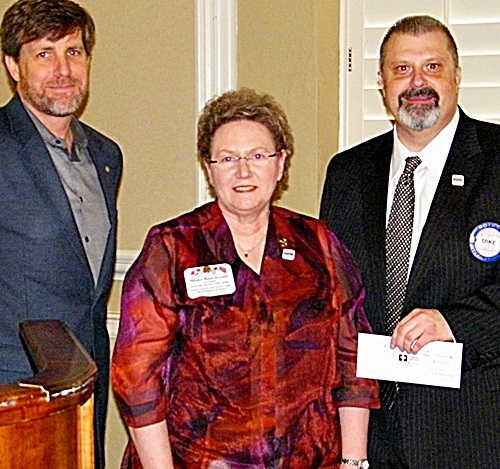 Rotarians and their friends responded by contributing a total of $2,825 toward a goal of $3,000. Shad Hallihan and Alberto Filipponi from the Joliet Township High School District presented information at last week's meeting on a new program scheduled to pilot in the district in the fall of 2012. The program 1:1 will provide Netbook tablet computers to all incoming freshmen, on the first day of school at the Central campus and the second day of school at the West campus. Congratulations to the slate of incoming 2012-2013 Rotary officers and directors who were voted on at the annual meeting. A lifetime educator, Kase is also an international trumpet artist that has heralded high acclaims from around the world. His performances have taken him on solo tours of Sweden, Norway, England, Germany, France, Russia, Switzerland, Canada, and across the USA. After Joliet Rotarian Doug Spesia's death in 2010, a memorial fund was started to construct the Douglas Spesia Centre in Thyolo, Malawi. In Malawi, water-related illnesses, including cholera and typhoid, are common due to the lack of access to clean water. The village of Thyolo was in need of a clean water source. Recognizing this need, the Joliet Rotary Club stepped in to help. 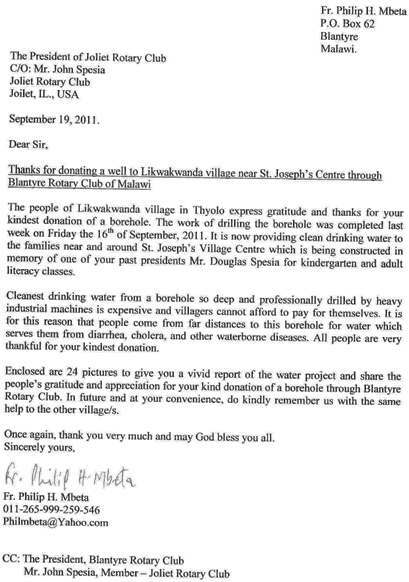 On July 21, 2011, the Board of Directors of the Joliet Rotary Club approved funding to construct a deep well at the site of the Douglas Spesia Centre to provide clean water for the people of Thyolo. Fr. Philip Mbeta discusses the importance of having a clean water source near the Centre. Click here to view transcript of Fr. Philip's comments. 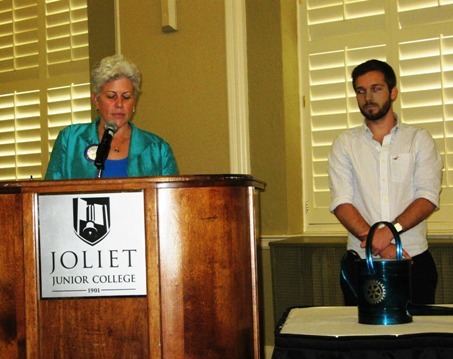 The Joliet Junior College Career Connects program was introduced to Joliet Rotarians at a recent Club meeting by program specialists, Tammy Tschida (left) and Jeremy Ly. The Career Connects program is part of an online career guidance and planning program reaching over 60,000 students and job seekers in Will and Grundy Counties. Joliet Rotarian Anastasia Tuskey thanks club members for their continued generosity toward the collection for Joplin, Missouri tornado survivors. Called the deadliest single tornado in 60 years, Tuskey announced that the collection has already netted $500 for devastated town members who saw at least 116 of their own killed. A project close to her heart, Joplin, Missouri is Tuskey’s hometown. There will be an additional collection at the Joliet Rotary Cub meeting on July 12. WJOL Radio’s Lynne (Lichtenauer), Mary (Lancaster) and Natalie (Manley) entertained Joliet Rotarians during a recent club meeting at the Renaissance Center as they recalled humorous radio experiences, as well as how they came together to form the Lynne Mary and Natalie show nearly a decade ago. Their very popular show is on WJOL every Friday morning at 9 a.m. The Rotary Club of Joliet recently donated items and gift cards to help replenish stock of three local community pantries after the holidays. As part of Joliet Rotary’s month‐long holiday‐giving program, 24 cartons of pantry items such as boxed and canned food, and baby, personal and paper products were distributed to Forest Park Community, Peter Claver and Spanish Community Centers in Joliet. 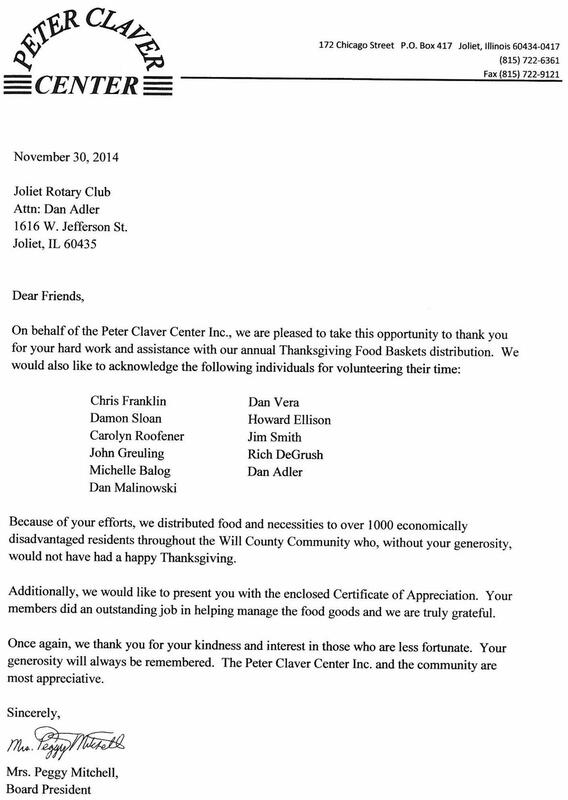 Each Center was also awarded $250 gift card for additional pantry items. The following Rotarians have been slated for election as officers and directors for the 2011-2012 year at the December 14th annual meeting. One additional Director, Bret Mitchell, is completing the first year of a two year term. Current officers Mike Murray and Dan Mihelich do not stand for election as Past President and President respectively. Taste For Rotary: A Great Success! 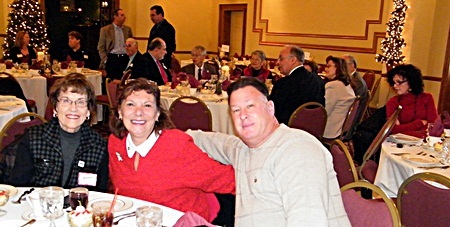 On Thursday, Oct. 28, Joliet Rotarians enjoyed great food, an open bar, and warm fellowship at the first annual Dist. 6450 "Taste for Rotary" culinary event at Abbington Distinctive Banquets in Glen Ellyn. Many thanks to Tom Grotovsky for his work on the District's planning committee that made the event a reality. It was a great success! 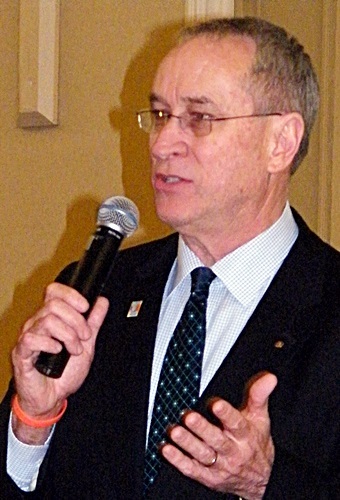 Joliet Rotarians listened to interesting bits of Civil War history, when historian Bob Kuzma spoke about the Will County Regiment – the 100th Illinois during a recent Club meeting. Introduced by Rotarian Judge Jeff Allen, Kuzma spoke about the regiment whose roots and membership came from Will County – many from Joliet. Organized at Camp Irwin in Joliet, the 100th Illinois were routed to the South, including Louisville, Kentucky and Chattanooga, Tennessee. For 40 years Pat Andreasen of Plainfield has served as an auxiliary volunteer at Provena Saint Joseph Medical Center. Among her many achievements, she was recently awarded the Silver Eagle Award by the Rotary Club of Joliet. This honor is awarded by the Club to an individual who has demonstrated outstanding leadership and volunteerism. For taking time out of your schedule and attending the event: Mike Murray, Lisa Las, Bill Kaplan, Mike Ritoff, Merriam Merril, Ricardo Espinoza, and Kathy Zydek (accompanied by her husband John). The community of Joliet was also represented by the Chicagoland Speedway (who donated a 3-day pass for next season), the Department Restaurant, the Renaissance Center, who both donated food and service and to a whole table of distinct Joliet personalities who took time from their schedule to attend this event. I was very proud to represent our great Rotary Club #78 in joining with Rotary District 6450 to plan this great event which brought in approximately $50,000.00 for Easter Seals and Autism. Thank you everyone! Do you know of a worthwhile project in need of funds in our community? The 2010 Rotary Raffle Project selection process has begun. Applications for a possible project will be accepted until the deadline of Tuesday, Nov. 23, 2010. The application form is available in the DOWNLOADS section of the Joliet Rotary website, or by clicking here. For more information contact Jane Hopkins via e-mail: Jhopkins@dowcompanies.com or call (815) 730-1900. The Rotary Club of Joliet wrapped up their annual raffle sale during the club’s weekly meeting on Sept. 28. There were eight monetary prizes – two (2) at $500, five (5) at $1,000, and one (1) at $10,000. Dr. Craig T. Wright won the top prize. The raffle is a long-standing tradition and has contributed to many worthwhile causes in the community. A special thank you to raffle chairs – Tom Grotovsky, Erin Webster O'Sullivan, Laurie Peyla Rambo, and Kathleen Zydek. Rotary Foundation Fund Drive Chair Mike Hennessy kicked off our club's drive to raise needed funds in support of our Rotary International Foundation. Our club's goal, and the goal of Rotary International, is for every Joliet Rotarian to contribute a minimum of $100 in support of the Rotary Foundation. In the spirit of service above self, several members of the Joliet Rotary Club participated with Easter Seals on the 14th Annual Celebration Telethon. Congratulations to Joliet Rotarian, Dr. Phyllis Wilson who was selected as the 2009 recipient of the Joliet Region Chamber's ATHENA Award. Winners of the 2009 Joliet Rotary Club Raffle were drawn on Tuesday, September 22, 2009. 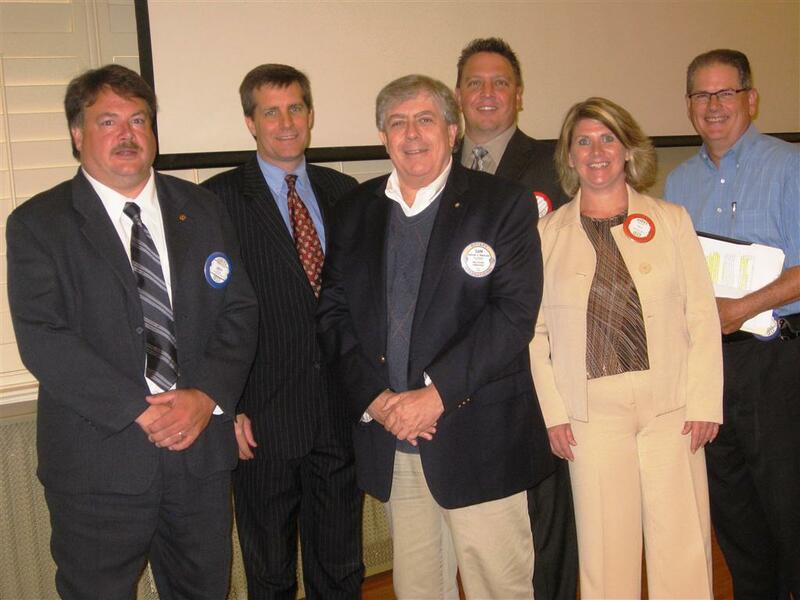 The Nominating Committee of the Joliet Rotary Club met for the purpose of proposing a slate of officers and directors for the 2010-2011 year. 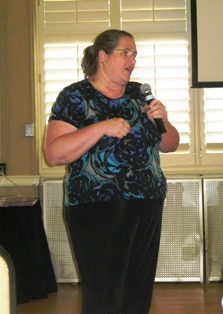 Jane Hopkins was installed as the 2009-2010 club president by Bill Lauer on Tuesday, June 30, 2009.